The Victoria Station Upgrade is a £700m programme of works to upgrade one of London’s busiest Underground stations. The project is being undertaken by a joint venture between Taylor Woodrow and BAM Nuttall and the work is taking place in a heavily constrained site where safety is, as ever, our number one priority. We have a number of worksites in the area, and there’s a need for staff to use several pedestrian crossings to access these. We’ve applied a policy whereby we ask all staff to wait for the green man when crossing the road so that their safety comes first, even if they are in a hurry. 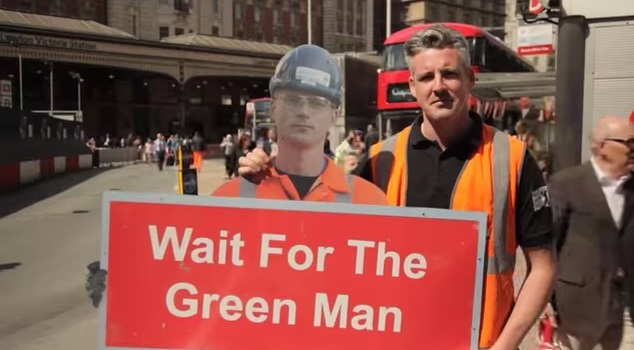 The initiative has been rolled out using life-sized cut-outs of staff from the project, each holding a sign to ask everyone to wait for the green man. This simple method gets people’s attention and brings the message to life. They are positioned at crossing points all around the site to ensure that staff are reminded of our policy, and have even influenced the general public in waiting until it’s safe to cross when they see our staff doing so. The initiative reminds everyone to stop and think about their safety on a daily basis. Its effectiveness has been recognised by other sites and the initiative has been rolled out on projects as far afield as Hong Kong, and it also featured on YouTube.